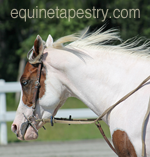 Becky Turner commented in the previous post about the foil saving clean-up time. I was so pleased with this side benefit to my clay-saving tactic that I decided to try something similar with the inner pieces. 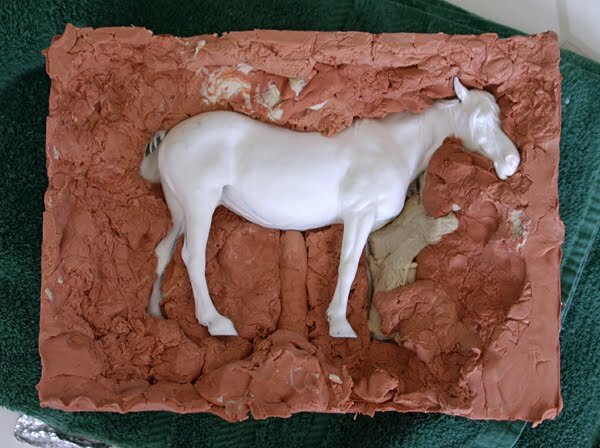 This is a picture of Elsie before I formed the inner pieces with clay. 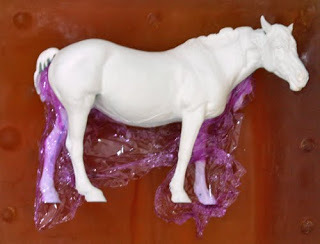 I used plastic wrap to line the inside of her belly and legs, then added the clay on top. When the piece I poured this morning – the second large side – cures, I will have to remove the clay placeholders. 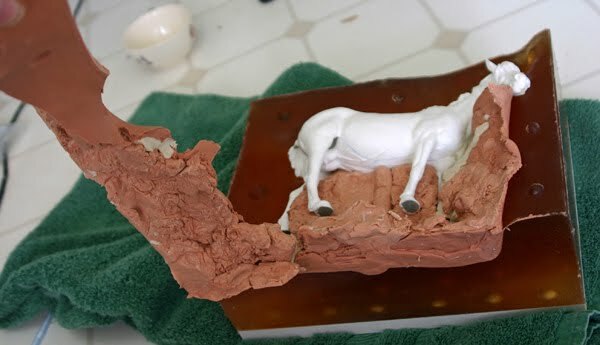 It is best if that can be done without breaking the seal on the two side pieces, but that can be impossible when soft clay is stuck to all the detailed bits under the belly. My hope is that by lining some of that area with the plastic, I can pull it free more easily and leave less of a mess. Tomorrow I’ll get to see if it worked. 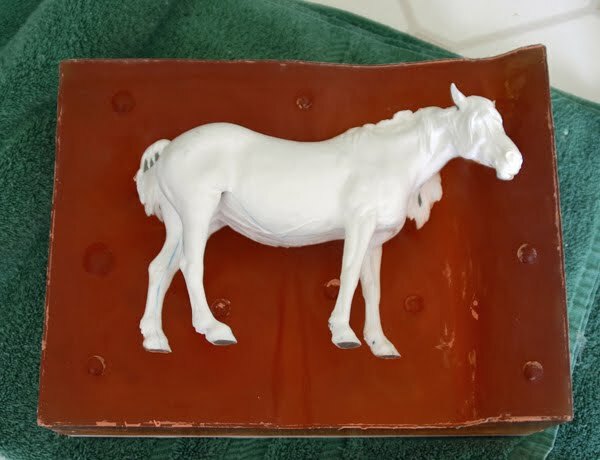 Extra rubber arrived earlier this week, so I was able to top off the first side of Elsie’s mold. It took a total of 8 lbs. of rubber to do this one side. I wanted to pour the side pretty deep because I was spanning a fair distance (11″ inches across) and I wanted to be sure there wasn’t any flex to the mold. In this picture, I’ve embedded beads to make keys for the plaster support that will reinforce this side. With the plaster poured and the mold board removed, this is what I have. The bottom is the wooden shelf piece that I used to build up the clay around Elsie. The next layer is the plastalina clay that was used to block off the area. After that is the first rubber side piece, and finally the plaster reinforcement. You can see to the left what a steep drop her turned head (just barely visible in the left hand corner) creates. That kind of abrupt change will not work for a plaster mold, but the purpose of this mold isn’t to make a plaster mold – at least not yet. At this point my goal is simply to get a rubber Elsie. 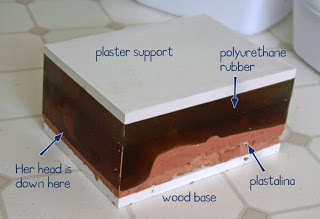 The top two pieces (rubber and plaster) make one major side of the mold. 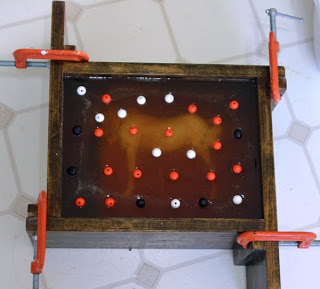 My next task will be to block off the inner pieces with clay and pour the second side piece. I should add that I have set the mold piece down on a towel because the plaster support is still quite damp. Until it truly dries, a good blow on a hard surface can fracture it. The towel is a softer surface, but mostly it serves to remind me to set the mold down carefully! 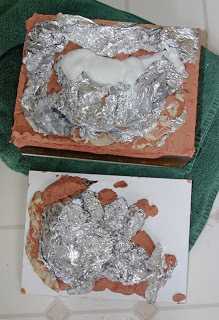 One of the side benefits of using the foil was that the original was much cleaner than usual, since very little clay was actually touching the resin surface. In fact, it peeled off in one long piece, leaving behind a fairly clean original. There is a little bit of clean-up to get her ready for the shaping of the inner pieces, but using the foil was a great time-saver in addition to minimizing the weight.